With so many different options out there, it’s important to find the best air fryers available to purchase! Here are the ones that you need to consider! Before hopping into the amazing air fryer options to purchase, it’s important to understand what an air fryer truly even does. Does it shorter cooking time? Sometimes. Does it use a substantial less amount of oil? Yes! 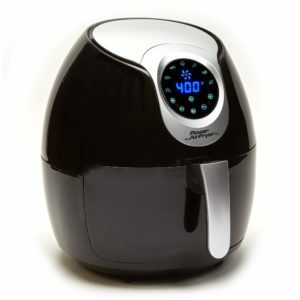 Basically, some foods can be cooked without oil in the power air fryer, while others may need a bit of a lesser amount. The cooking methods can vary depending on the recipe as well. If you want oil, you can add oil. If you don’t want oil, you can give it a go with less and see if you like the outcome! 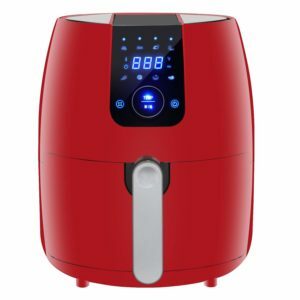 It is possible to have a type of oil less deep fryer with your air fryer, depending on your recipe of choice! What I love most about my Air Fryer that I use is that it’s simple, it’s a healthier option and it still gives that deep fry crisp, without all that added grease, oil and fat. I love knowing that anything that I put into my Air Fryer, will come out perfectly cooked. I mean, c’mon, that crunch of food is awesome, right?! The answer is no to this one. While they make seem similar, the way that the air fryers cook may be different. Some may be different sizes (16 quart, 8 quart, etc) and others may have options to even rotisserie and dehydrate as well! Do your research before deciding which one is right for you and your family! The best part about searching for Air Fryers online is that you can compare all the options quickly and easily. Read the sizes, the warranty, the cooking information and see if the options come with cookbooks as well. All those things are important when it comes to finding the ones that is best for you! When looking at and comparing all the air cookers and air fryer ovens out there, here are some of the best to consider! Not only does this power air fryer oven fry, it also dehydrates and rotisserie as well! You can add fruit and make some awesome fruit jerky, too. 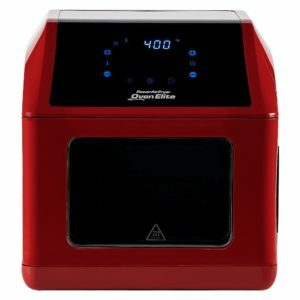 Reviews love the ease and size of this appliance, but the option to dehydrate as well. Think about all the fruit strips and healthy fruit snacks that you can make for your little ones! Another great feature is that it has a touch screen, easy to use and read screen and comes with 3 different cookbooks for all your food needs! 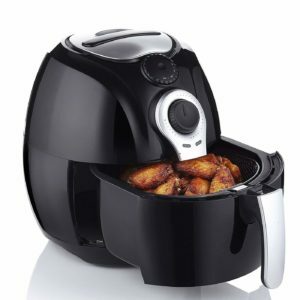 Our house is vegetarian, but I know many people love to use their air fryer to fry foods like chicken wings for the football season! 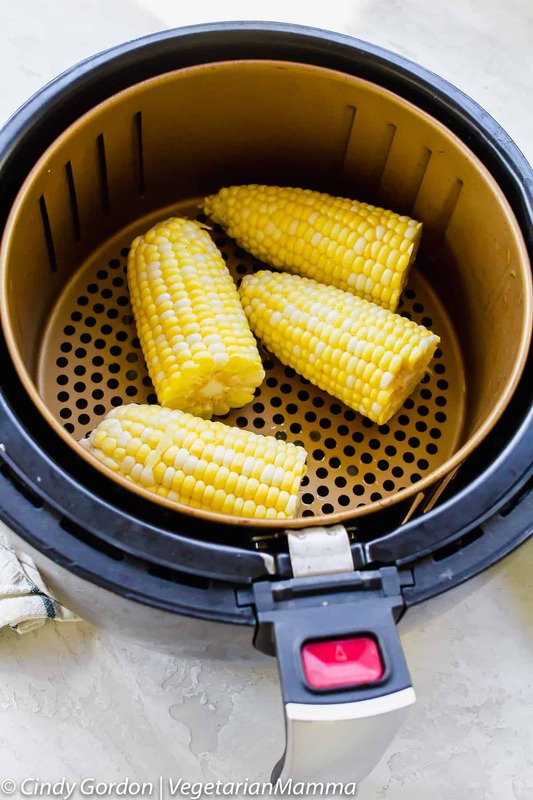 Fyer foods have never been more simple than with this hot air fryer. Plus, this one gives you the option to bake as well! Fry some veggies and then back up a cake? Yes, please! The best part about using this appliance? You don’t have to turn on your oven in your house. During those hot summer days, this appliance is perfect. Keep the focus on circulating hot air inside your air fryer, and not inside and around your home! Those who own this state that it’s more like an air baker, than a fryer and things cook up crispy and delicious with ease! This is the one that I have, and I can’t say enough great things about it. It even comes with a baking insert and a pizza pan! Pizza in your power airfryer xl? 100% yes! Not only is it simple for me to use, but my family also loves it as well. With the push of a button, this power air fryer xl can make up any after school treat or quick dinner option that my family can enjoy. Plus, cooking with fewer calories is something that we all can love and relate too! Clean up is simple and the size of this air fryer allows for hefty meals to be made inside. Air fryer reviews on Amazon even show that some people pack it and take it with them on trips and vacations. With the ease of it only having to be plugged in to work, this makes total sense to me! Owners of this air fryer agree that the browning of the food that this machine can do it top notch. Again, crispiness is key when it comes to eating food from your air fryer! The design of this appliance is a bit smaller and round, but it still cooks up your food with ease each and every time. Clean up is a breeze and this air fryer gives you an easy way to cook up your food with a healthier twist! Yes, you read that right! Not only does this little gem fry, but it also gives other options for baking and grilling as well. Plus, it’s dishwasher safe making it an absolute breeze for cleanup. And isn’t that so important? The time you spend cleaning up shouldn’t overshadow the use of the machine! If you are looking for a great way to cook a variety of food and meals, this is a great option for you and your family! It’s time to invest in an air fryer for you and your family! With all these amazing options above, you should have no issue figuring out which one is right for you! 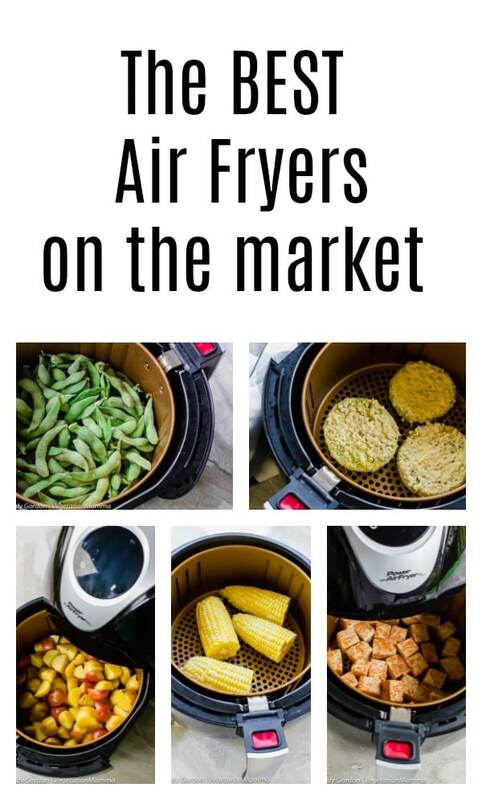 If you are looking for some of the best air fryer recipes out there, check out HERE for some great options! 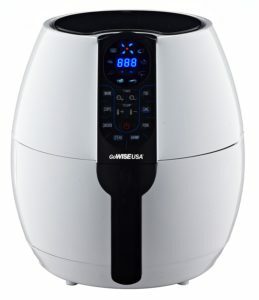 Did I miss a GREAT air fryer? Leave your favorite air fryer name in the comments! I don’t know anything about air fryers, so this is very helpful. They seem to make life so convenient – I would definitely love to have one! I got an air fryer a few years ago but haven’t used it much. This post reminds me I need to take it out more often. There is so many great recipes I can make with it. So many great things you can make in them! I have an air fryer and do not know how I survived without one. It really is awesome. I own the Magic Chef one. That’s awesome! What is your favorite thing to cook in the air fryer? While we don’t eat meat, I hear that things like chicken tenders and wings are amazing in it! I never knew what it is used for. Now I know. Get review. I will get it tomorrow. Let me know which one you decide on! I have seen so many amazing air fryer recipes on the web lately. I really need to break down and FINALLY buy one to have on hand to make all of them that look so delicious. 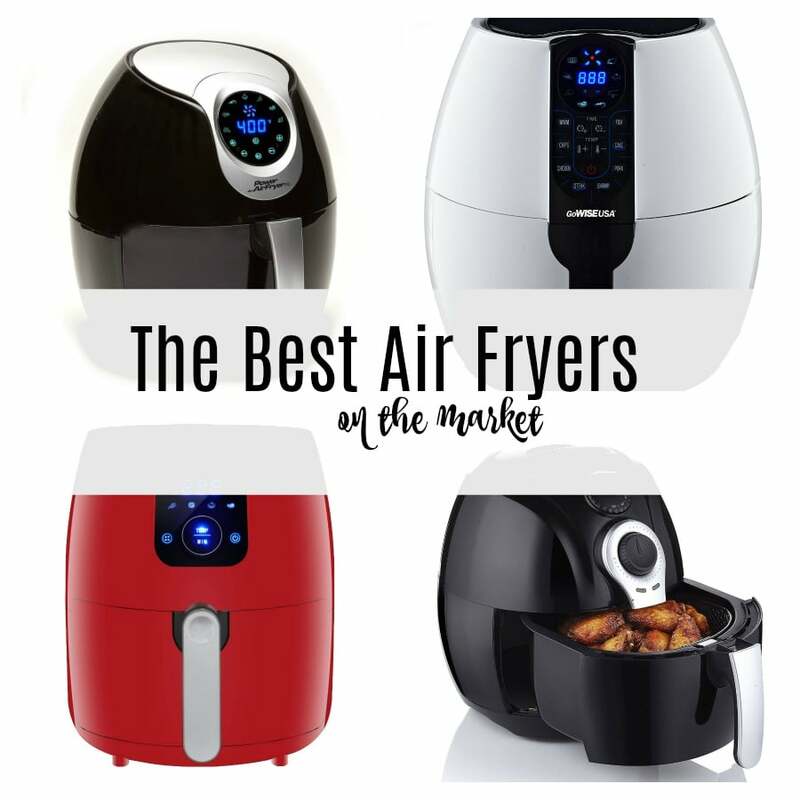 There truly are so many great air fryers out there on the market! For sure add it to your Christmas list! It is a MUST HAVE in the kitchen! I use my air fryer a lot! I purchased a very simple, inexpensive one from walmart.ca because I didn’t know if I was going to use it that much, but it is something I use a lot. There’s a huge range of prices but my Toastmaster basic model does everything I need. It’s just me so I didn’t need a large one. I make what I call potato crispies very often — I scrub and cut potatoes with a wavy cutter into small cubes, put them in a bowl with a very small amount of oil, shake them around, pop them into the air fryer on highest heat for about 13 minutes or so — shaking from time to time. Tonight I had the first baked potato I’ve had in years. I scrubbed, punctured and microwaved a medium potato for 4.5 minute, rubbed oil on it and baked it in the air fryer at 390 for around 10 minutes, turning it once. What a great evening snack. If you don’t need all the bells and whistles then get a simple one – but check the size you will need. You can do everything in it you can do in an oven — easier, faster, and with less electricity. I use mine a lot too! There is a huge range of prices, totally agree! The potato crispises sound delicious!